1. Begin by cutting 2cm width strips of First Edition Christmas Promise 12x12 paper. We have chosen two paper designs for our wreath and have cut out 53 paper strips. 2. Start wrapping each strip around your polystyrene wreath, ensuring to overlap each strip that you add. Use Dovecraft Perma Fix tape to secure each piece at the back. 3. Continue wrapping strips around your wreath until it is completely covered. 4. Cut a Dovecraft A4 Acetate sheet down to fit the back of your Christmas wreath. Adhere it with Dovecraft Perma Fix tape. 5. Cut a length of Dovecraft Ribbon and adhere it with Dovecraft Perma Fix tape to the back of your wreath, at the top. Using the Christmas Promise paper, cut a rectangular piece and cover the bottom of your ribbon. 6. Next, cover your MDF letters with two layers of DecoArt paint- Everlasting. Once dry apply a layer of First Edition Foil Transfer glue to the front of your letters. 7. Pick a foil design and with the silver side facing down, rub your foil sheet on top of the letters, this will help you achieve a vintage look. 8. If there are any large gaps, go back and fill them in with more foil. Continue to do this until you’re happy with the look of your MDF letters. 9. 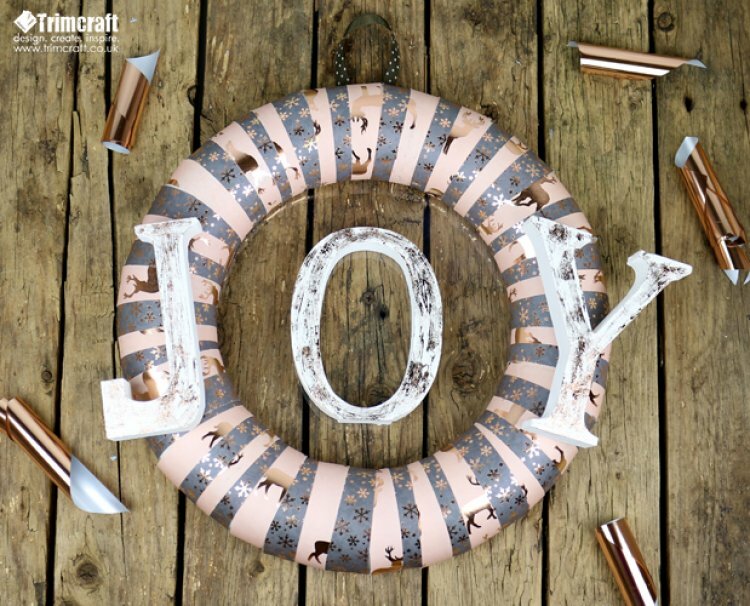 Attach your letters to your Christmas wreath to spell the word ‘JOY’ with Dovecraft Perma Fix tape. Add the J and Y to the left and right hand side of your wreath, ensuring they’re placed in the centre. Adhere the O to the centre of the acetate. TIP: Ensure your JOY letters are secure on your project. If you’re not using Dovecraft Perma Fix tape, ensure to use a strong adhesive. This stunning Christmas wreath will look wonderful hung up and would make a fantastic gift for a friend. The colour of the First Edition Christmas Promise papers are so neutral that this project would look wonderful in any home during the festive holidays! What papers will you use to create your Christmas wreath? We would love to see so remember to upload them to the Inspiration Area and to #trimcraft when uploading to social media.